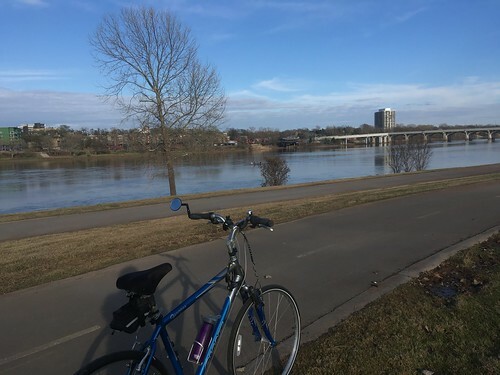 Earlier this week I went biking on Tulsa’s Riverparks trails along both sides of the river for about 14 miles total. I saw my first rowers of the season. They have been absent for a while because their boathouse burned down. They are back in business now. I love watching them. It looks very hard work. Here they are making great progress on against the water flow of the river. 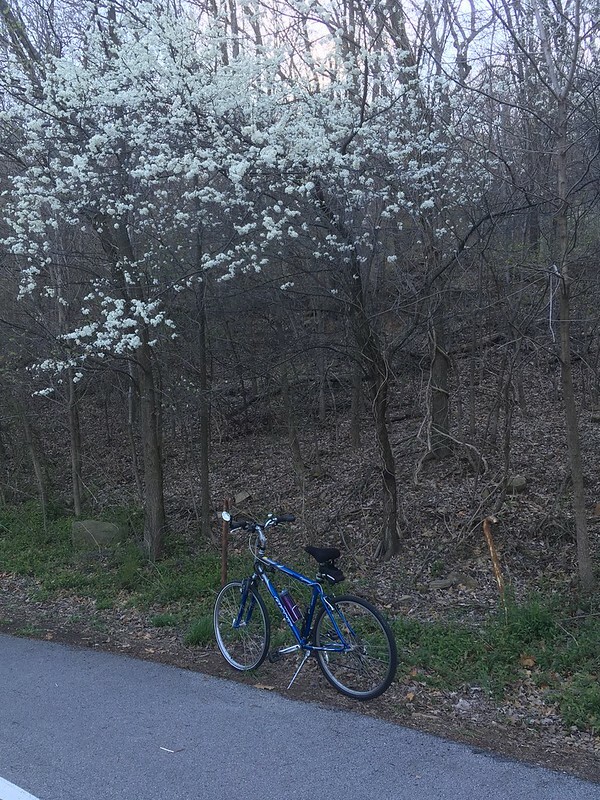 I stopped near some white bud trees at the base of Turkey Mountain. 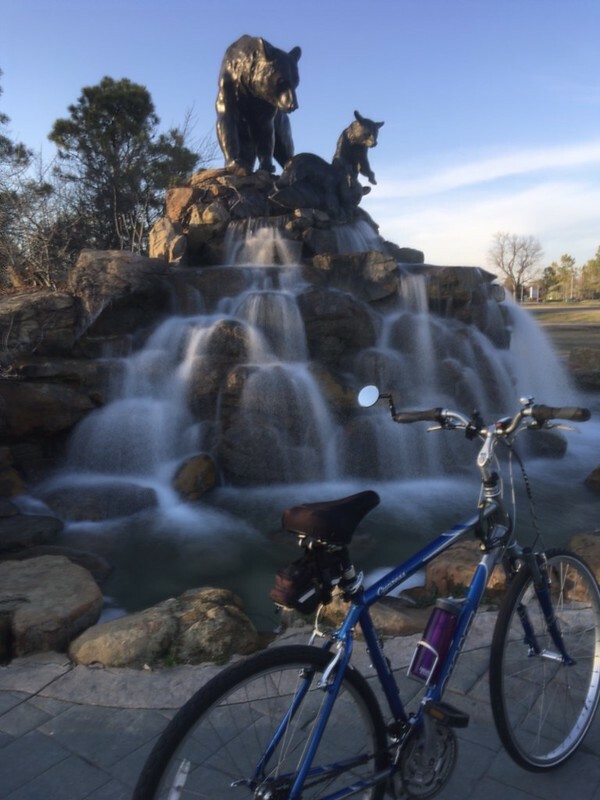 And at what I call the Bear Fountain at the southern end of my ride. Notice the flowing water effect? I use a new photo app called Spectre to get that. It can do that while hand held, no tripod needed although that would be helpful. Note how the rest of the photo is a little fuzzy? I have dozens of photo apps. I have so many I forget about them. How about you, what are your favorites. I use Snapseed the most. 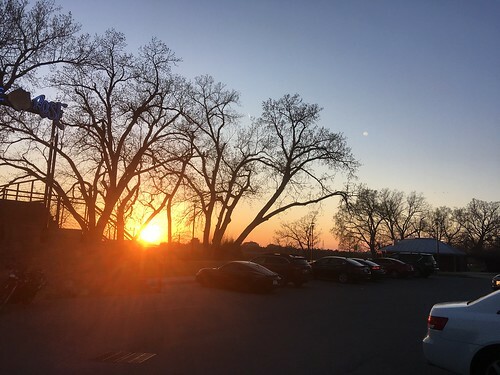 It was sunset by the time I got back to my car. Wait a minute you are saying, the post title says something about flowers! Sorry, I get distracted. Here are some flowers. Tulips at Tulsa’s Woodward Park. I love them. I used my macro lens. It takes great pics of flowers, and squirrels, but no squirrel pics today, sorry. And this is a little overexposed and then I “fixed” it and then I went back to the original image. It’s good to share our trials and tribulations, right? And that is it for this week. I had to finish up my post on my iPad and it worked fairly well. I am linking this to Skywatch Friday, which I moderate. Come check us out! 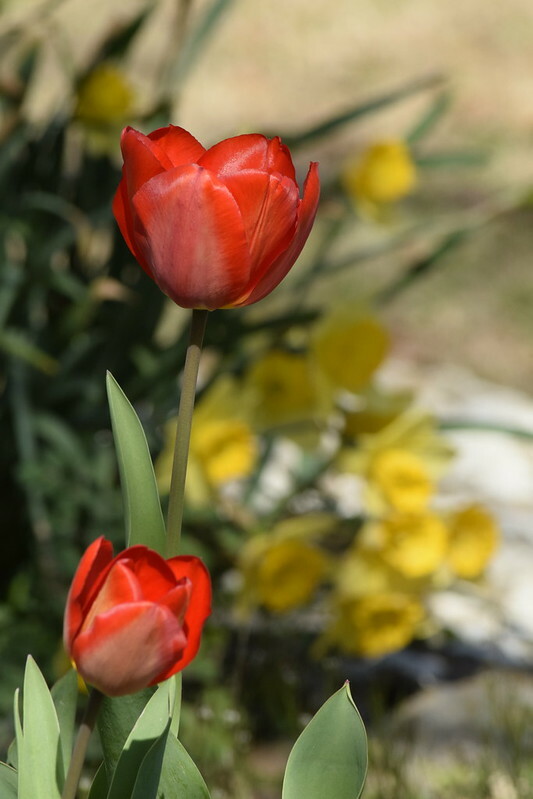 This entry was posted in Uncategorized and tagged Tulips on April 4, 2019 by Alan Bates. Hello, pretty view of the river. I love the bear fountains and the horse sculpture. The tulips are lovely. Cool reflection shot. Enjoy your day and weekend ahead. 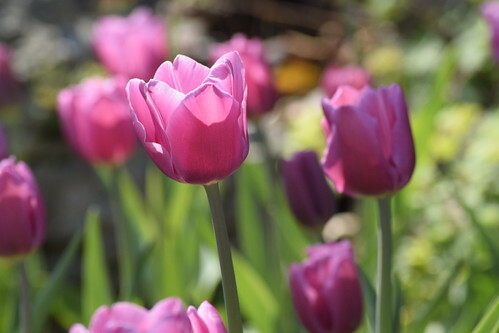 Beautiful Tulips! Love the flowering trees too. 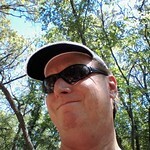 I think the white buds are kin to the red bud trees we have here. What great photos, I love them and the video! I like watching rowers on tv but have sadly never seen them in person. Good for you … and a nice bike!! Love where you stopped by the sculpture of the bears – beautiful and powerful! Funny, but here in California we are behind – just now the daffodils started blooming, so we’ll still have to wait for the tulips. Also, just to mention, the a boys night out is so special! Beautiful tulip shots and I like the video clip. 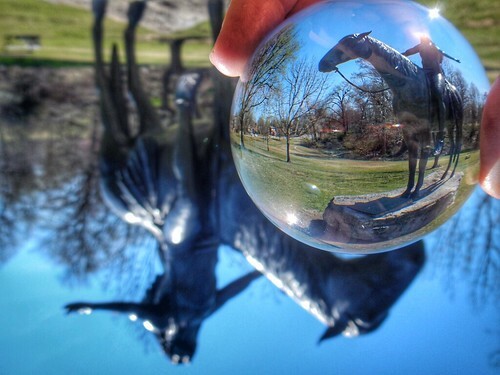 You’re getting very creative with that lens ball! I don’t have many photo apps. and I don’t use the ones that I do have very often. Just distracted I guess. I would have to arrive very early with a tripod and shoot long exposure to get that flowing water. Very nice flower images. Have a great week. From all the nice photos I can see that it was a wonderful bike ride. Love the effect of your photo apps. The flowers are beautiful in all their lovely colours. Have a happy weekend! Lovely to see spring! Nice shots. Enjoyed the cyber bike ride with you. Have a great weekend. Nice spring scenes. Have a great weekend. Lots of blue sky for all that riding. Wow, I’m impressed with 14 miles. Pretty flowers. Guess I’m too much of a purest and only use Lightroom. Is that an app? I think you’ve gotta be mega fit to row as long and as fast as some of them do. Looks like that bike gets around! 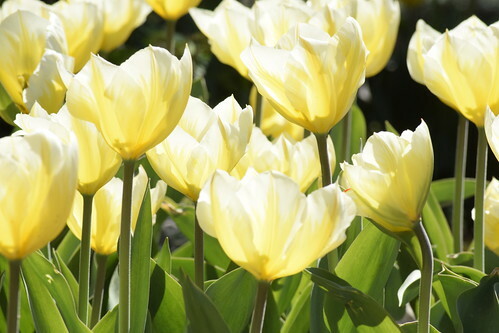 The tulips are so lovely. And so is that white bud tree! That really looks like an enjoyable bike ride! Those tulips!! I am so envious.